WASHINGTON (Reuters) - The pineapple, the tropical fruit enjoyed by people worldwide in slices, chunks, juice, upside-down cakes, jam, tarts, ice cream, yogurt, stir-fry dishes, piña coladas, glazed ham and even Hawaiian pizza, is finally giving up its genetic secrets. Scientists on Monday said they have sequenced the genome of the pineapple, learning about the genetic underpinning of the plant's drought tolerance and special form of photosynthesis, the process plants use to convert light into chemical energy. The genome provides a foundation for developing cultivated varieties that are improved for disease and insect resistance, quality, productivity and prolonged shelf life, University of Illinois plant biologist Ray Ming said. Pineapples, domesticated about 6,000 years ago in what is now southwest Brazil and eastern Paraguay and currently grown in tropical and subtropical regions worldwide, are big business. They are the second most important tropical fruit crop behind bananas, and are grown in more than 80 countries, with an annual value of more than $8 billion. "The industrial production of pineapple in Hawaii a century ago made pineapple a popular fruit worldwide because of its extraordinary flavor and aroma," Ming said. Pineapples are the most economically important crop that uses a type of photosynthesis called CAM, or crassulacean acid metabolism, that evolved in arid locales for high water-use efficiency. It is one of three types of photosynthesis and differs from the forms in the vast majority of plants. Most crop plants use a type of photosynthesis known as C3. Plants with CAM photosynthesis use 20 to 80 percent less water than typical crop plants and can grow in arid, marginal lands unsuited for most crops. 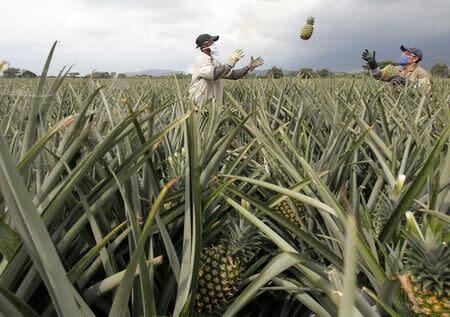 Mindful of global climate change forecasts, the researchers said understanding the pineapple genome may help to engineer drought tolerance into other crops and even engineer C3 photosynthesis crops like rice and wheat to use CAM photosynthesis. "As such, CAM photosynthesis applications could hold major significance for the entire food industry," added plant molecular biologist Qingyi Yu of the Texas A&M AgriLife Research Center at Dallas. Some of the pineapple's photosynthesis genes are governed by its circadian clock genes, which enable plants to distinguish between day and night and adapt their metabolism accordingly. Ming said this makes sense because CAM photosynthesis lets plants close pores in their leaves during daytime and open them at night, helping retain moisture. The research appears in the journal Nature Genetics.